Pebblewriter.com is being transferred from GoDaddy to Hostgator. But, it takes a couple of days for the content to propagate to various servers around the world. So, some of you in Asia, parts of Europe, the Caribbean, India and the Middle East are not able to see posts made over the past 24-48 hours. For the next couple of days, I will update this site alongside the pebblewriter.com site so you're not left out in the cold. I will also repost a couple of recent posts that were lost during the transition. If you get an error message when accessing the site, simply go to the address bar and remove the "s" and then refresh the page. While you're at it, this would be a great time to edit your bookmarks, etc. You might notice that once the few remaining bugs are ironed out, the site will run much faster and more reliably. Disqus doesn't play well with SSL, so comments will now be easier to make, append and edit. I have already been impressed with Hostgator's excellent customer service. The propagation hit my server about 10 minutes prior to the opening bell this morning. My email and a couple of administrative pages weren't working properly. I called the 800 number and got right through. Ten minutes later, everything was good to go. Nothing much has changed since Friday's close. There's a slight negative bias, which could be nothing more than consolidation after Friday's rally. 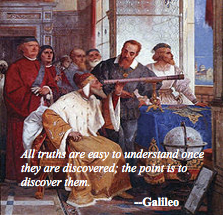 We'll play along on the downside, with the understanding that 1673 is still on the table. In other words... tight stops. Price has been on a tear, but the underpinnings of the rally have been fading the past several days -- as seen on the 60-min RSI chart. We went to cash at the close Friday because of the conflict between short-term and long-term patterns such as are displayed in the currencies. The euro and dollar have hit short-term targets, but have more room to go before the tide turns. SPX just pushed above 1667. I'm going to switch to the long side with stops at 1667 in the expectation that it's headed to 1673. Note that we're currently above the yellow TL connecting the 1994 and 2002 lows, and at 1667.50 have pushed above the top of the purple channel itself. As I mentioned earlier, this might be nothing more than an intra-day move. But, we can't ignore the possibility of a breakout here. It's visible on both the short-term and longer-term RSI charts -- the action immediately ahead of us will determine which it is. I'll likely take a crack at an interim short position with any push through 1669.60. Here we go... interim short here at 1669.60. Totally jumped the gun on that one. Stopped out with a bounce at the top of the purple channel. Should have been more like 1669. Too bad, because the dollar's confirming a drop here -- as is SPX RSI. I'll just wait for a push through 1669 itself. 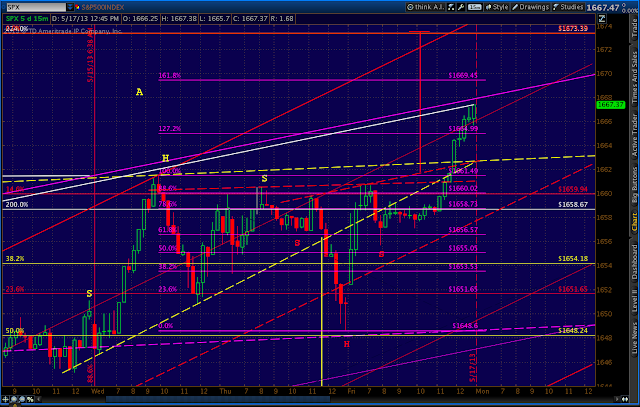 As always, watch for the back test of the broken channel/TL -- in this case, stops around 1670.50 should be safe. Got very close to the yellow TL and bounced. It's not clear yet whether that was the extent of it. 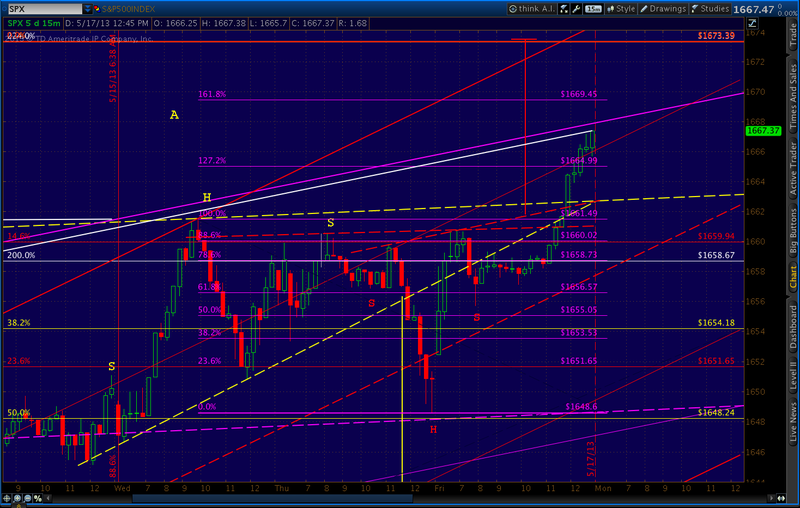 But, I'd expect SPX to at least tag the red channel midline -- currently at 1663.75. There is a good possibility that DX will sell off a little more first -- say 83.609. But, that could easily happen overnight. If not, look for SPX to retrace to 1670-1672 before any additional downside. In other words, a potential gap and crap on the opening bell.